With Halloween and bonfire night gone, we all know the next occasion that is lingering around the corner. For those who frequent the coffee shops, you may have noticed that the Christmas cups have officially arrived. Yes, Christmas is not far off and the decorations are even closer to entering into our homes. So for the all important decoration wars, here are our tips to stay on trend when Christmas decorating within your home. September’s London Fashion Week brought the beautifully rich golden yellow colour to the table. 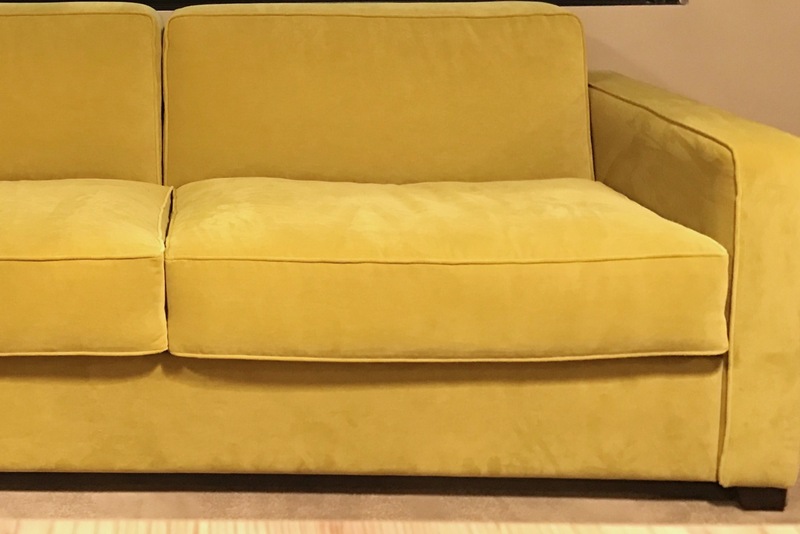 From catwalks to interiors, we knew at the time that golden yellow was going to be a big thing. And we weren’t wrong – It certainly has confirmed our key colour for Christmas decorating. Now we are all well aware that this is the ultimate Christmas decoration. Why? Because it is the first thing you see when approaching someone’s home at Christmas time. So it has to be knock out. The money leaf from John Lewis is a pretty golden yellow and would look beautiful against a painted grey or white door. 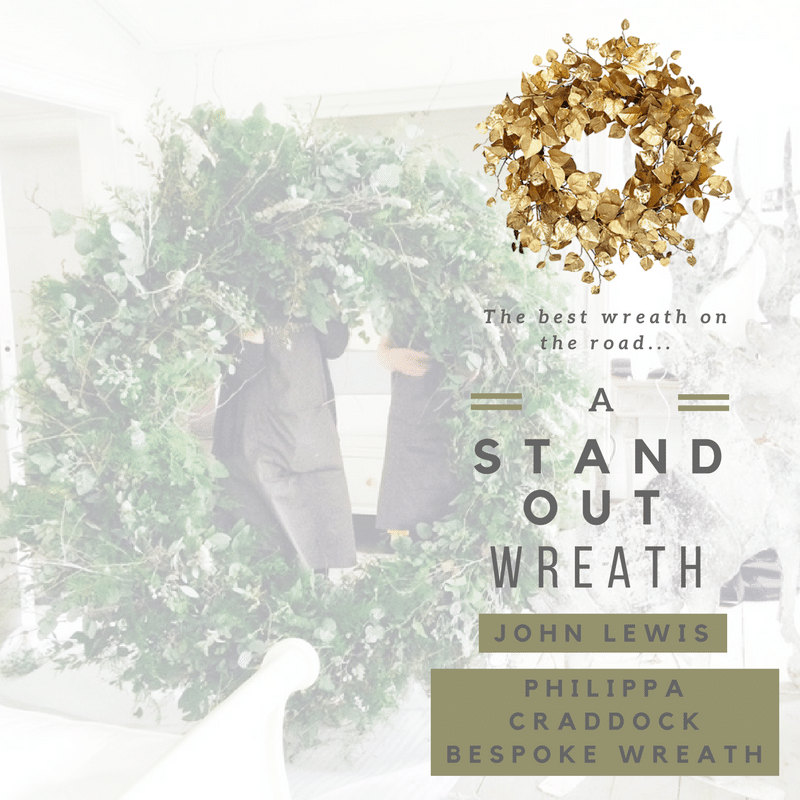 However if delicate is not what you are going for, we suggest the ultimate wreath from the fabulous Philippa Craddock. She charges by the metre, so you really could go to town. Archway is the new wreath. Add in a few golden feathers for interest and serious stand out status. The tree usually takes pride of place in our living rooms, sometimes in the hallway if we have space. However you have to make it look like it has always lived there. Like the tree is meant to be there. The way to make this happen is to integrate it into your living room scheme. To stick to the golden yellow theme, we suggest this year splashing out on a golden tree. The sparkling golden tinsel tree from M&S would work a treat. However don’t worry if you are not a fan of the fakes. Get creative and spray a real tree with glimmering golden spray paint. Of course golden yellow is new to town and so there may not be a whole lot of gold in your rooms already. 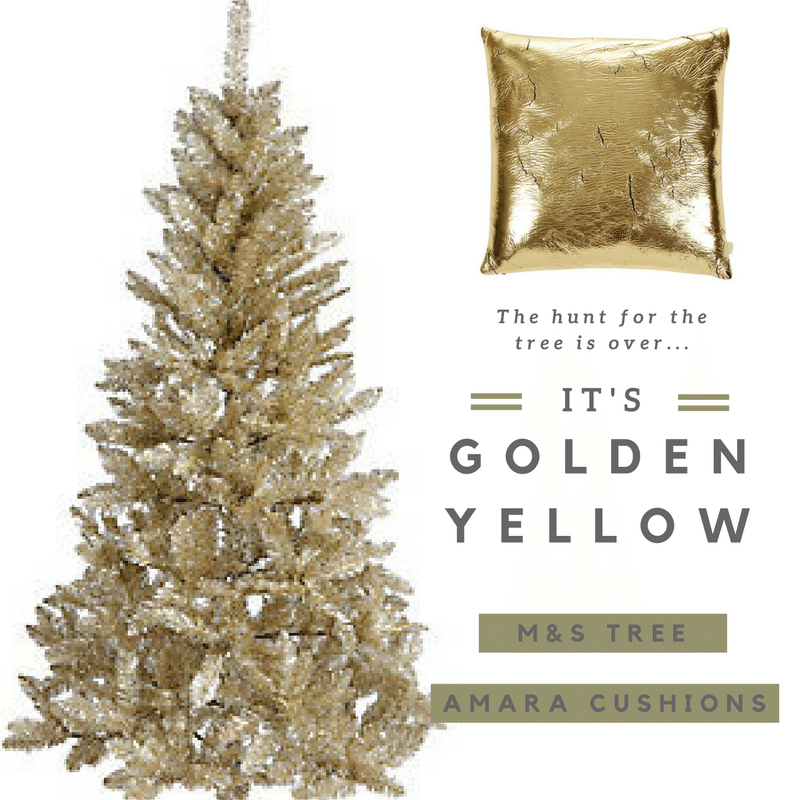 Make the tree fit by adding in a couple of golden yellow crack cushions from Zoeppritz at Amara to your sofa and chairs. The golden yellow boundaries can be pushed so much as to decorate simply by using gold! I mean it does class as a yellowy finish, doesn’t it? So we propose a new set of cutlery especially for Christmas. Beautiful golden knives and forks will add the perfect touch to your table this Christmas. No matter what your budget, you will be able to find something to work. 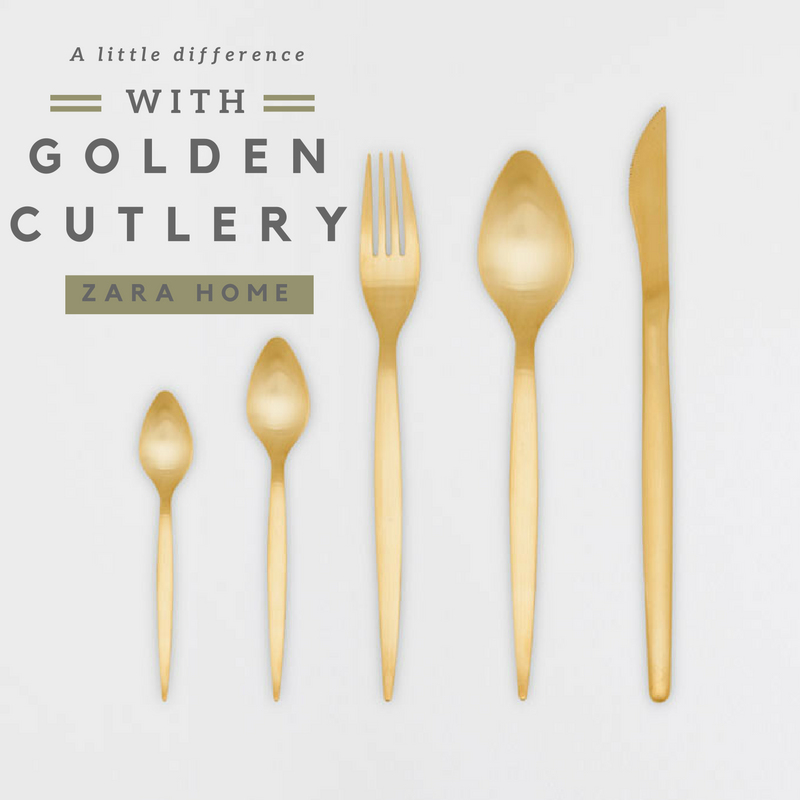 For those saving the pennies, head to Zara Home to find the perfect golden set. For those looking to splash out try the 16-piece set from Nordic House priced at £160. You want the cutlery to stand out as the feature on the table, so pair them with simple white crockery, elegant glassware and lots of candles. Christmas decorating aside, the decorations are not the only thing we can add to our homes to celebrate at Christmas. To say the least, we can add swanky brand spanking new furniture into our homes. After all, it is the time of year to splash out on ourselves isn’t it? Plus we are absolutely certain that a new sofa will make the Christmas festivities all the more easier. So have you got family staying? Why not take a quick last minute dash to our showroom to have a look at our ‘perfect for every night’ sofa beds. Lots of our customers use them every night of the week. So they really would be a brilliant addition to your living room to ensure you can fit all the family this christmas. Yes, of course they are available in a golden yellow fabric! In fact they are actually available in loads of different fabrics in loads of colours. And better still, by adding the express delivery the sofa beds are still available to be delivered BEFORE Christmas! Now wouldn’t that just be the best addition to Christmas decorating everrrr.. Previous Previous post: 3 amazing bedroom colour schemes – which one would you choose?